This California Mission Revival building, constructed of cast concrete block, was built in 1908 as Ashland's second fire station, Ashland Hose Company No. 2, to serve the thriving Railroad District. Motivation for the structure likely stemmed from a devastating fire in May 1903 that destroyed much of the Fourth Street commercial corridor. The building also served as an auxiliary police station, complete with drunk tank, probably a necessity given the many bars and taverns located here during the railroad's heyday. The iron bars of the cell remain visible on the buildings north elevation. The building was damaged by fire in the 1930s and was vacant for many years until Haskin's Garage moved in and rehabilitated it. 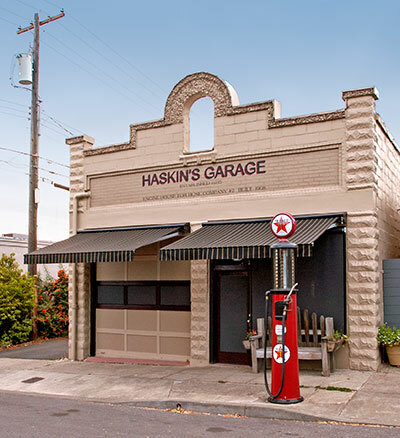 Haskin's Garage contributes to the Ashland Railroad Addition Historic District which is listed on the National Register of Historic Places (NRHP). Adapted from the NRHP nomination in 1999.